TETRA is an international standard for digital mobile communications. The police and other emergency services in the UK are gradually adopting TETRA systems. They are high-powered, and can cause UHF TV interference problems. Bill Wright describes the problem and the remedies that can be used. Rates: UK 1 year £33.80, 2 years £54.00, 3 years £71.00. Overseas subscriptions available. Please make cheques payable to "Television". TETRA stands for TErrestrial Truncked RAdio. It's an international standard for digital mobile communications and, in the UK, the police and other emergency services are gradually adopting TETRA systems. TETRA bears some resemblance to the digital mobile phone networks, but the cells are generally larger and the transmission powers higher. The introduction of any new transmission system is likely to cause some degree of interference to existing services. But the problems that TETRA is causing to TV reception seem to be much more widespread than anyone anticipated. There are deep political issues involved with the implementation of TETRA and, in many districts where a TETRA mast has appeared, there is local feeling that the Home Office, having committed billions to the scheme, is riding roughshod over responsibility for TV interference problems. This is not the place to go into that, so I will simply describe the technical problem and suggest remedies. The frequencies allocated for police and fire service TETRA use in the UK are 380-385MHz (mobile) and 390-395MHz (fixed). The company that operates TETRA, O2 Airwave, is building a network using these frequencies - the process should be more or less complete by the end of the year. There is nothing particularly pernicious about these transmissions. TETRA interference has become noteworthy simply because the transmitters are new, quite high-powered, and are often in residential areas. Most of the normal TVI (TV interference) remedies apply when dealing with TETRA interference. But, as the interfering signals are digital, some familiar TVI symptoms such as audio breakthrough will not be present. And as the base stations transmit continuously the interference does not stop and start like, for example, TVI from a taxi base station. Apart from these points, my comments here about TETRA interference apply equally to any strong interfering transmissions, especially to those between 300-450MHz. (1) The TETRA mast is within a few km. (2) The TV aerial is vertically polarised. (3) The TV aerial is of the group A (chs. 21-35) or wideband type. (4) A masthead amplifier, particularly a two-stage one, is in use. (5) The TV field strength is poor. Since TETRA transmitter aerials are flat panels that are designed to radiate most power towards the target area, the field strength in areas very close to the mast might be rather less than expected. But areas on high ground 2-3km from a mast, on the other side of a valley for example, can be pretty well swamped with signal. Interference problems are uncommon when the TETRA field strength is relatively low, unless a masthead or distribution amplifier is in use. At locations where the field strength is very high however interference is quite common, even where the TV field strength is good and the aerial is connected to the TV set directly, with no signal amplification. If the interfering field strength is very high, the unwanted signal can enter either via the aerial or directly into the TV set or VCR. This is really an EMC (electromagnetic compatibility) shortcoming with the TV set or VCR. The symptoms can be very peculiar, and may not look like TVI. More or less anything is possible, though a common symptom is faint patterning - even when the TV set is working with a scart input. I'm generalising from experience with only a small sample, but the very cheap 'supermarket special' TV sets seem to be more susceptible to the problem than others. If you come across a set that works perfectly on your bench but persistently misbehaves in the customer's home, have a good look around the immediate neighbourhood for a transmission mast. Since TETRA often shares a site with cellphone and other transmissions, the mast will probably not be new. Look for new panel arrays. These will often be mounted below the cellphone panels, on arms that position them away from the mast. Some TETRA transmission sites are atop blocks of flats, so TV sets on the higher floors of adjacent high-rise blocks may be in a very strong interfering field (the occupiers will be as well - there are contentious health concerns about this). TETRA transmissions are properly engineered of course, and the out-of-band radiation should be tiny. Nevertheless the second harmonic coincides with UHF TV ch. 60. So, if you encounter strange problems with this channel, TETRA could be the culprit. Normally it's the fundamental frequency that causes the trouble, because 400MHz is well within the passband of most aerial amplifiers. Thus the vast majority of problems arise when some sort of aerial amplifier is in use. If you think about it, use of a masthead amplifier means that the TV signals are likely to be on the low side, so a fairly-close TETRA transmitter could produce a field strength 30-40dB higher than that of the TV signals. Even allowing for the fact that the aerial is pointing at the TV transmitter rather than the TETRA mast, and isn't designed for 400MHz reception, it is quite likely that the masthead amplifier will be presented with enough input signal to cause overloading. In its resulting non-linear condition, the amplifier will add interference to TV channels that have no obvious relationship to the interfering frequency. The effects vary. 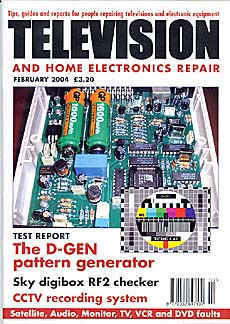 DTT (Digital Terrestrial Television) often withstands this interference surprisingly well, and remains unaffected when the analogue channels are quite badly affected. But reception will be impossible beyond the point where the DTT carrier-to-noise ratio falls off the edge of the 'digital cliff'. Because the TETRA signal is digital, the familiar telltale signs of breakthrough are not present with analogue TV reception. The word 'breakthrough' implies that the interfering carrier's modulation is visible or audible in recognisable form at the TV set, and this doesn't happen with TETRA. There are no disembodied voices whispering "you go round the back while I watch the front" or suchlike police chat coming from the customer's TV set. Interference to analogue reception can be mistaken for that caused by an oscillating masthead amplifier, but a closer examination of the screen will often suggest the real cause of the trouble. Photo 1: TETRA 'tyre marks' on a TV screen. Reception was with a vertically-polarised log-periodic aerial and a single-stage UHF/VHF masthead amplifier, 3km from the TETRA mast which was 15° off-axis from the TV transmitter. The TETRA field strength was 15dB stronger than that of the analogue TV channels. The appearance of the patterning varies a great deal, dependent on the relative strength of the interference, but Photo 1 is fairly typical. The distinctive white horizontal bars, each made up of diagonal stripes, have given rise to the description 'tyre marks'. 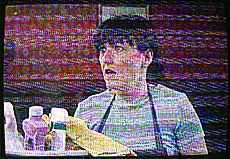 This effect is presumably the result of the pulsed nature of the TETRA signal. There may well be cross-modulation, with one TV channel appearing faintly behind another. In a really severe case TETRA can wipe out the TV signal completely. But the first time I encountered TETRA interference the symptoms were much less dramatic. There was slight cross-modulation, and some rather vague patterning on the screen. At first I wondered whether the masthead amplifier had some weird fault. When I connected the aerial lead to the spectrum analyser I saw, as expected, a huge spike some way below the UHF TV band. Thinking that the amplifier was oscillating, I disconnected its power supply as a check. This should kill any such oscillation of course. But to my surprise the spike, though greatly reduced, was still present. When a small screwdriver was used as the aerial the spike was very tall. I climbed on to the roof and soon found that the signal, at 392MHz, came from the direction of an innocuous-looking cellphone mast about 3km away. A two-stage masthead amplifier is much more likely to be affected than a single-stage one. Two-stage amplifiers have a gain of about 25dB, single-stage ones about 14dB. Quite often the extra gain provided by a two-stage amplifier is unnecessary, and the only thing you need to do to get rid of the interference is to fit a single-stage one instead. The rule-of-thumb I use for assessing whether a two-stage masthead amplifier is required is simple. Assuming that the downlead losses are less than 3dB, I would consider the use of a two-stage amplifier only when the weakest analogue channels are below -8dBmV (52dBµV) at the aerial terminals. If TETRA or other signals below the UHF TV spectrum are causing problems, it's best to use a UHF-only masthead amplifier. These incorporate a high-pass filter that can provide a good degree of protection against interference at 400MHz. It's also important to use a fully-screened masthead amplifier. Most if not all the major manufacturers now have fully-screened products available. Some of the more 'vintage' masthead amplifiers are poor performers by modern standards, and are very susceptible to strong out-of-band or in-band interference. Maximum output levels are often rather low, which means that the cross-modulation threshold is easily exceeded by unwanted transmissions. Having sorted out the masthead amplifier, if there is one, the next thing you have to consider when faced with strong out-of-band interference is the use of filters. Fortunately lots of these are available. Four basic types are relevant: bandpass, channel-pass/leveller, notch (single or double) and high-pass - see Photo 2. Photo 2: Various types of filter. Clockwise from the top left: bandpass; channel-pass/leveller; high-pass; single-notch and double-notch. A bandpass filter passes only the specified frequency range. A high-pass filter rejects everything below its cut-off frequency. A notch filter rejects a spot frequency. A channel-pass filter passes only the channels specified. There are pros and cons with each type but, whichever type is used, it must normally be inserted before the first amplifier in the system. All filters lose a little bit of the wanted signal as well and, with the filter in front of the masthead amplifier, the carrier-to-noise ratio will inevitably be degraded, if only slightly. This is unavoidable, but in a marginal reception area it's a good reason for not fitting a filter if this can be avoided. In a difficult case where it's felt that the slight loss before amplification introduced by the filter is unacceptable, it might be possible to use a low-gain amplifier before the filter. Further amplification to overcome cable or distribution losses can follow the filter. In many cases a bandpass filter will do the trick, with no further complications. They are also known as 'group-pass filters'. Since the filter will normally be before the masthead amplifier it will usually be outdoors, so it must be built into a weatherproof housing. Fringe and Maxview amongst others have such filters. The Maxview MHF range is fully-screened and has F connectors. It includes types for channels 21-37, 21-42, 21-68, 35-53, 35-68 and 48-68. To reject TETRA at 400MHz, use the filter designed for the highest possible group of channels. Through-loss with the wanted channels is less than 1dB while the rejection at 400MHz is better than 25dB. High-pass filters are most familiar to us as in-line CB filters. Examples are the Antiference TVI and TVI-U. The cut-off frequency of these filters is generally not high enough to reject TETRA signals. Notch filters come into their own when a distribution system carries VHF-FM and DAB radio as well as TV. A notch filter tuned to the exact TETRA frequency should be fitted in-line with each aerial feed prior to the amplifiers. Aerials for DAB can receive a lot of TETRA signal, but fortunately a double-notch filter can provide very high rejection - as much as 40dB is possible. Accurate tuning is difficult without a spectrum analyser. Taylor Bros (Oldham) make notch filters for any frequency. 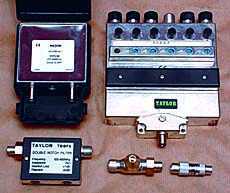 Alternatively bandpass filters are made by Taylor Bros for VHF-FM (type TBP2) and DAB (type TBP3). These are indoor units which are intended to be fitted just in front of the distribution amplifier. In the unlikely event that a masthead amplifier is used for VHF-FM or DAB, the filter can be fitted into a standard ABS electrical junction box. A 120 x 180 x 50mm box with a rubber seal on the lid is ideal. It is unlikely that you would need to resort to channel-pass filters with a simple domestic installation. On the other hand the majority of distribution systems would benefit from having such a filter at the aerial input, even when out-of-band interference isn't a problem. But if the aerial receives TETRA or any other unwanted signal at significant strength a channel-pass filter/leveller is a must. By 'significant strength' I mean about 6dB lower than the digital TV multiplexes. Since TETRA often appears at the aerial terminals at higher strength than even the analogue TV channels, it is very likely in areas with TETRA coverage that a distribution system will need a channel-pass filter/leveller. We now take this for granted, the only exceptions being small systems with twenty or fewer outlets in places where the TV signals are very strong, at about 20dBmV or more. Filters for five analogue channels and six digital multiplexes can cost as much as £150. Believe me, we wouldn't use them if there was a cheaper alternative that works as well. Don't start adding filters and changing masthead amplifiers without giving the aerial a cursory glance at the very least. A bit of aerial work can pay dividends both technically and financially; the latter because customers seem to see more value in shiny things on the chimney than in boxes in the loft or your time. The fundamental requirement is to improve the ratio between the wanted and unwanted transmissions as much as possible. First I'll state the obvious: the aerial should be pointed at the TV transmitter accurately, and should be sited as advantageously as possible. If raising the aerial or moving it to another chimney gives better line-of-site to the transmitter without improving the view towards the TETRA mast, it's worth doing the work. Apart from alleviating the TETRA problem, there will be a general improvement in reception. Don't waste your time putting the aerial off-beam from the transmitter in the hope of 'nulling out' the interference: it doesn't work. TV aerials designed to work right down to the bottom of the UHF TV spectrum (470MHz) seem to function surprising well at 400MHz, even exhibiting directional properties and gain! If possible, avoid the use of wideband aerials. These are often installed unnecessarily nowadays, thanks largely to a widespread misconception that they are always needed for DTT reception. If all the analogue and digital TV signals required are in group B or C/D, the low-frequency response of a wideband aerial merely contributes to troublesome interference such as that from TETRA. The inferior performance of a wideband in comparison with a grouped aerial can also make a difference. As a desperate last resort, it might be possible improve the signal-to-interference ratio by relocating the TV aerial to a spot that's screened from the TETRA mast. Unfortunately 400MHz signals aren't attenuated by buildings and trees as much as UHF TV ones, so this might not be all that effective. Most VHF-FM aerials have to be installed horizontally, which helps avoid TETRA interference. Unfortunately DAB aerials have to be installed vertically. The electromagnetic spectrum has become ever more crowded over the years. 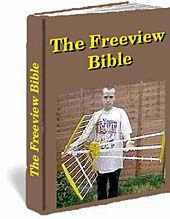 During my time as an aerial installer I have seen all sorts of innovations that have caused UHF TV reception problems. In the late Seventies and early Eighties there was the CB craze. After that we had the illegal high-powered cordless phones. Meanwhile many of the CB fanatics migrated to amateur radio and started to transmit lots of watts at 144MHz and 432MHz, usually in the middle of crowded housing estates. Next illegal video senders became popular - I could write a book about the trouble they caused. Low-powered RSL radio stations have sprung up all over in recent years, cellphone masts adorn every bit of high ground, and we now have five analogue channels and six digital multiplexes competing for space in the UHF TV spectrum, with the old channel-spacing rules thrown to the winds. No wonder we have interference problems! We must remember though that the majority of these problems are not caused by the interfering transmitter but are the result of poor EMC (electromagnetic compatibility) at the receiving end. Poor amplifier design, the wrong type of amplifier, cheap coaxial cable, poor TV set design and an inadequate aerial installation can all open the door to interference. Ensuring good EMC performance has become an important part of installers' work over the years. TETRA is just the latest challenge. I'm sure it won't be the last! I have an aerial in the roof with masthead amp, piped down to the lounge, looped thru 3 sat recs VCR & DVD then distribution boosted to rooms. I have an intermittant interference issue on BBC2 and SKY only. It manifests as red/blue herringbone pattern in horizontal bands moving upwards slowly; sometimes narrow; sometimes wide enough to almost cover the screen. Sometimes picture switches to black & white and interference goes. Lounge TV OK on EXT (scart) not OK on UHF. Upstairs TV is terrible until En-suite electric heater is used then PERFECT!! No I can't leave it on!! It seems to fit the tetra bill almost perfectly, poor reception area, masthead amp (how do I tell if its 1 or 2 stage?) tyre tracks just like the picture. Only prob is I get the same on Beeb 2 Analogue terestrial and apparently I shouldn't. It started a few weeks ago, I dont know if Wiltshire Emergency Services commisioned a new mast locally to Calne (Mendip Trans). How do I find out? When I find out which type of masthead I've got I'll go thru the options Bill gives. MP by email: Try switching off the power to the Amp. You should then get a very "snowy" but relatively interference-free analogue picture. That would prove that the Amp is contributing to the problem. If the interference is made worse then that would indicate that the interference is getting in *after* the amplifier - probably through inadequate cable. I identified the Tetra Transmitter that was causing my problem about 2km in roughly the same direction as Mendip, hiding behind a tree..
Because I have my aerial in the roofspace I decided to try an experiment. I shielded the aerial temporarily with Turkey Bacofoil by pinning it to the rafters. It seems to have done the trick.